After our emotional visit to our family ancestral home of Diyarbekir, we continued our journey through historic Armenia, heading southeast through the towns of Bitlis and Datvan. Bitlis is located in a mountain pass in the eastern Taurus Mountains, which continue into present day Armenia. Shortly after leaving the city of Diyarbekir, we stopped in the old historic town of Dickranagert for lunch. As we passed through winding narrow streets, lined with shops for the locals, men sitting on short stools visiting and drinking tea, we could see remnants of the old walls of the great Dickranagert hidden here and there behind stone homes and shops. We stopped for lunch of kebab, salad, pita and ayran (tahn). The rest of our drive consisted of another endless day of road construction, bumpy unpaved roads, and exquisite views along the way. We stopped occasionally to enjoy the views, to look at the rivers below, to marvel at waterfalls carving odd shapes into the rocky peaks, and to marvel at old bridges, and small villages along the way. Our next stop - Bitlis - came in the late afternoon, when all of us where anxious to get out and stretch our legs before continuing our journey to Lake Van. Bitlis is a small town, with homes that fan up like an amphitheater from the river vale. 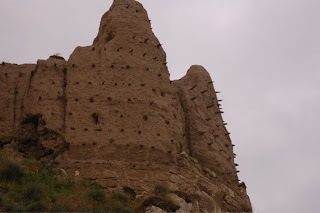 At the top of one side of the city sits the remains of the historic castle of Bitlis, dating back to the 9-10th Century. This city was once the home to Armenians, but no trace of our ancestors now exists. While the rest of the gang climbed yet another set of steep steps to get to the top of the castle, I decided to enjoy a "drive-through" car wash. Our driver crossed the road, and stopped at one of the shops that repairs tires, paid the owner a few Turkish Lira, and stood by (with me inside!) as the owner and his son soaped down the van and washed it after the dirty journey with a massive power spray. Interestingly, most petrol stations offer the same service for a few coins, along with tire service. The latter is a must! With the road conditions what they are, I simply cannot imagine how one set of tires could last long around here. Leaving Bitlis, we continued to wind through the mountains for another few hours, enjoying some magnificent scenery along the way. High peaks with ice still sitting sporadically along the ridges, leading into grassy slopes that formed the border valleys with fields of multi-colored wildflowers. Occasionally, we would see a village dotting the landscape, some with a mosque, some made up of old, dilapidated brick/masonry buildings that would never survive even the most mild earthquake. Yet, people lived in these dwellings. We saw flocks of cattle, sheep and goats along the hillside, roadside and meadows, occasionally being guided by their owner. The weather was cloudy, and hazy, and we had concerns that our scheduled trip out to the island of Akhtamar the next day might be impacted by bad weather. But, not to worry! After checking into the hotel and having a light dinner after our 8:30 p.m. arrival, we went to bed, eagerly looking forward to our busy day of touring the area the next day. 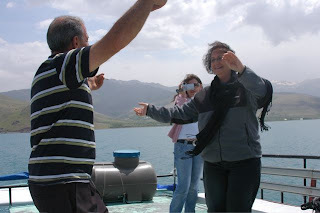 Ah, but not before Debbie got up and did some folk dancing with the Kurdish owner and staff of our hotel sitting right on the edge of Lake Van. The next morning, we arose early, and began what would be a very busy, and exciting day. Having lost several hours because of the bad roads and long journey, we were packing into one day what we would have done in two. 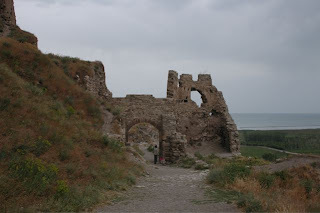 First, we drove a few miles up a narrow village road to the remnants of a monastery called "Varakavank." This little complex of 5 churches was historically tucked in the middle of a small village. Only 2 or 3 of the attached churches are still intact. Several years ago, an Armenian priest from Istanbul gave money to a Kurd from the village and told him to maintain what was left of the church complex. After the priest died, the money stopped. But, the man continued to do his best to protect the church. On this day, we saw his wife who let us into the church. We visited the remains, and, as we exited from the church, were surrounded by the village children. As we walked up the dirt road to see the remains of one of the five churches, the children shyly followed us and asked us to take their pictures. Seeing this small compound of Armenian Churchs, or what was left of them, was a pleasure, particularly in knowing that someone cared enough to at least keep them from falling into further disrepair. We then drove several miles to visit Tushpa, the ancient fortress of the Van Kingdom, city high on a hill in a valley northeast of the lake. After driving up a narrow winding dirt path to the base of the castle, the youngsters (Harold, Lisa, Brian and our guide and driver) hiked up to the top where they walked the length of the ridge which was covered with the ruins of the ancient castle and walls. Debbie, Susan and I waited below, enjoying the view of the valleys below, with spotted groves of poplar trees, a river, and meadows of wildflowers. Eventually the gang came downhill, and we were treated to a viewing of something I never expected to find up there. Adjacent to the road was a small rock house perched on the hill, where men were sitting in front drinking tea (their favorite past time). Our driver, Vartan, beckoned to us to follow him -- we stepped up into a small room. 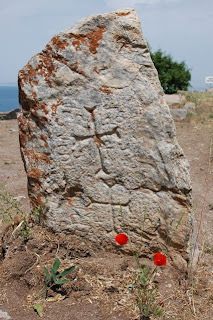 There, leaning against the floor was a small khachkar (cross-stone) -- traditionally used to mark Armenian graves. We marveled at how the Kurdish man who had found this relic had protected it. According to our guide, Marina, Vartan had passed through this way before -- at that time he befriended the men who owned this little cottage. When Vartan saw that they were using this khachkar to hold up a table, he told them "This is a grave marker - you must respect it." From that time until we saw it, the man removed it as the support for the table, and protected it, mainly hidden from sight except for Vartan's occasional visit. Our journey continued back to Lake Van, where we ate lunch, and then boarded a ferry boat for the 20 minute ride to the island of Akhtamar. We climbed to the top of the ferry and, thanks to Vartan, we listened to Armenian music as we sailed to the island. Not to miss an opportunity, we even enjoyed some Armenian dancing. Armenian folklore tells the story of the Akhtamar. The Church was originally a fortress and monastery built in honor of King Gajik of Vaspuragan. Princess Tamar, daughter of King Gajik, lived on the island. Legend has it that the princess fell in love with a fisherman who caught site of her from his fishing boat. Each night she would light a candle to lead the way for the fisherman to come and visit his beloved. However, the King learned of these secret tyrsts, and the next night, he secretly extinguished the flame. As a result, the fisherman perished in the waters of Lake Van. As he went to his death, he could be heard sighing "Akh Tamar!" And, thus, the island was named "Akhtamar". We climbed up the steps leading to the newly renovated church. The Turkish government, seeking to be admitted to the EEU, undertook the renovation of Sourp Khach with financial assistance from a non-profit organization in the United States between 2005 and 2007. A gala celebration took place on the day the renovated church was re-opened -- however, Armenians throughout the world did not rejoice -- the cross from the church had not been replaced, and the Turkish government proclaimed the site "a museum." 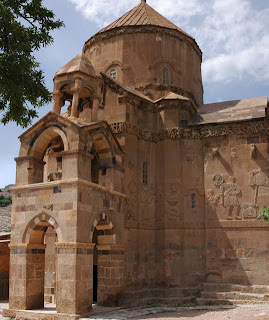 As we have seen throughout Western Armenia, this church had evidence of its Armenian roots inside and out, in its architecture, its carvings, its frescoes, and its style in general. But, NO WHERE on this island was any mention made of its origins. After lighting candles and saying Hayr Mer, we left the church and climbed up to the side where we looked at the magnificent carvings that told the stories of the Bible, and visited the graveyard where khachkars lay on their side, abandoned and crumbling. After sharing tea and brandy, and delicious Armenian chocolate, we hiked up the hill toward the peak of the mountain, and saw abandoned gravesites, with remnants of additional khachkars. On our walk down, we came upon a group of young women picnicking on fresh made sarma (wrapped grape leaves)! They generously brought their pot of sarma over to us, and encouraged us to taste their picnic delicacy. It was delicious and a real treat. 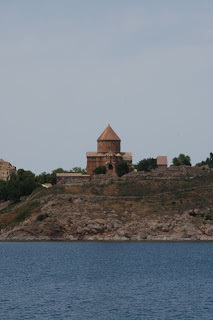 Our return journey to the shore was joyful -- we celebrated the fact that this Armenian church would at least be maintained, and not treated with the disrespect we have seen to so many Armenian churches throughout historic Armenia. Our day at the lake ended with a fish lunch. Our day was not over yet. After lunch (at 4 p.m.) we drove to historic Van Fortress, where Harold, Debbie, Lisa and Brian climbed up the step dirt pathways to the top and spent the next hour climbing over the ruins of the massive Van Fortress. Susan and I took the low road, literally, and walked along a road below the fortress where we viewed the old towers and walls from below. We then went back to the entrance area, where we sat at a picnic table waiting for the group to return. While there, we saw the famous Van cat -- a white cat with colored eyes, one blue and one green. As I tried to capture of photo of the cat, a man went up to the cat, lifted it and brought it to me. I learned that he was another of the many friends of our driver, Vartan (who was sitting not far from us having tea with his friends). His name was "Octavio" - he was half Armenian and half Kurd. He owned the large refreshment concession at the fortress complex. He told us, as we shared tea with him, that his grandmother was a 12 year old child in 1915 -- she was taken in by a neighbor who was a Kurd. When she grew old enough, she married the Kurd's son and they had a son, who was Octavio's father. Octavio told us "The Kurds destroyed Armenian relics in 1915 and we should be ashamed. I am half-Armenian and Vartan is my friend." Today, the Kurds and Turks are often in conflict because of territorial issues. We found it interesting to hear Octavio's version of his family history, and to hear his point of view which many Kurds have now voiced -- sadly, the Kurds are not blameless, now or during the time of genocide for allowing so many Armenian historical monuments to be destroyed. After our visit, Octavio's friend found the beautiful white cat, and Brian was able to coax it into trusting him for a few seconds -- thus, the picture below. 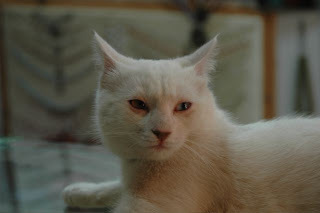 The white cat with colored eyes has its own story. The cat was owned as a pet by many Armenians in the late 19th and early 20th Century. During the time of the genocide, Armenians were not the only ones to suffer killings at the hands of the Ottoman Turks. They also slaugh tered the cats. However, as time passed, the Turks realized the uniqueness of this cat to the Van region. Today, a statue of the cat stands at one of the large intersections in downtown Van. The cat is now protected, and to remove a white cat with multi-colored eyes from the country is illegal. Sadly, the white cat with colored eyes has seen a better fate than the one and a half million Armenians who perished in 1915. Few if any Armenians still live in the City of Van, which once served as the capitol of Armenia.